In a world where the NFL’s leadership sits on their high horses and pontificates about how important player safety is…here we are about to watch players bang their helmets against each other a mere 4 days after they just did so for 60 minutes. Welcome to Thursday Night Football, ladies and gentlemen. This week’s edition of “Football after dark with Jim Nantz” features two teams led by quarterbacks who are now entering the “veteran” leg of their careers. Andy Dalton and Ryan Tannehill, drafted in 2011 and 2012 respectively, have now been around long enough where they’re no longer considered to be part of the “young crop” of quarterbacks. That label is now reserved for the Winston/Mariotta/Wentz clique. Despite the fact that the Bengals have been a thoroughly better team than the Dolphins for the past half-decade, Ryan Tannehill actually is 2-0 vs Andy Dalton in his career, with the most recent win coming on that dramatic Halloween Night in 2013, which coincidentally was also a Thursday Night game. Pop quiz time! What’s the most telling sign of a perennially mediocre NFL organization? Anyone? Anyone?….Buehler? The answer: roster and coaching staff instability. When I watched the film from that 2013 Thursday night game, the sheer amount of organizational turnover the Dolphins have undergone since that night is STAGGERING. Think about it, who were the key cogs in that riveting 22-20 overtime victory? Brent Grimes had a HUGE pick-6, he’s gone. Ellerbe and Dimitri Patterson also picked off Dalton, and they’re gone too. And remember our skill players? Lamar Miller, Brian Hartline, Mike Wallace and Charles Clay were basically the entire offense that night, combining for over 280 out of the 345 yards Miami gained. If you have been paying attention I think you know their whereabouts now, as none of those men are with the organization anymore either. Out of the 53 dudes that suited up for the Phins in that game less than three years ago, only 9 players remain with the team. For you math majors out there that is a whopping 17% of the roster was there just 3 seasons ago. Oh, and that is not including the Head Coach (Philbin) as well as both Coordinators (Coyle and Sherman) who are gone as well. When you scratch your head wondering why the Dolphins are bad year after year, look no further than their inability to retain top-level talent and have a semblance of organizational stability. 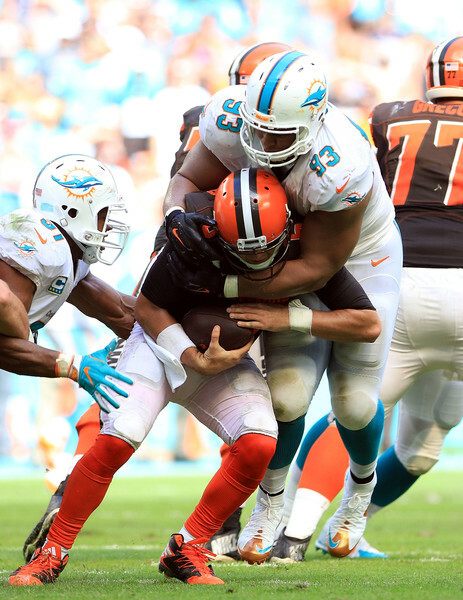 Ndamukong Suh and Cameron Wake go absolutely nuts against an unexpectedly shaky Cincinnati offensive line, and the Dolphins pressure Andy Dalton on a good 10-12 out of his (most likely 35+) dropbacks. The Bengals have quietly had a top 10 offensive line for a while now, but for some reason things aren’t clicking this year. If you want proof of this, turn on the game tape from their Week 1 victory in the Meadowlands against the Jets. You’ll see that they gave up 8 friggin’ sacks. EIGHT. Now don’t get me wrong, between Sheldon Richardson, Muhammad Wilkerson and Leo Williams, the Jets have arguably the scariest defensive line in the entire NFL, but from a pure pass rushing perspective the Dolphins should be able to eat here as well. Suh is currently the number 2 ranked interior lineman per PFF grading, and Wake is coming off a game against Cleveland where he was in the backfield every other play. I don’t have faith in these Dolphins corners to cover for very long, so getting to Dalton to make him uncomfortable will be of paramount importance. I can also envision a world where the absence of Tyler Eifert is felt by the Red Rifle and the rest of the Cincinnati offense. Eifert, you gotta imagine, would have drawn the Reshad Jones assignment, but since he isn’t playing, the frees up Reshad to do what he does best, which is play single high and freelance all over the place making plays. So much of what Cinci does on offense is timing based coming off of play-action, so their deeper drop passing plays can be slow developing by nature. It will be opportunities like these that the Phins must take advantage of, and get in Dalton’s face. For whatever it’s worth, Andy threw 3 interceptions on that Halloween night, and God knows he’s had his fair share of eggs laid in primetime games under the lights. If the pass rush can eat, Miami will have more than a fighting chance. You can probably guess what this is. Anyone who’s watched the three Miami games so far knows the biggest weakness of this team: Rushing Defense. The Dolphins come into Thursday night ranked second-to-last against the run, and they’re fresh off of back to back battering-ram-type schoolings from a pair of dreadlocked beasts in LaGarette Blount and Isiah Crowell. Normally, I chastise teams that make capital expenditures on Running Backs (whether it be in the form of free agency overpayment, or high draft picks) but the fact is that Cinci spent back to back 2nd round picks on Gio Bernard and Jeremy Hill in 2013 and 2014 respectively, and both young men are a huge part of their offense. Gio doesn’t run very much between the tackles in a traditional sense, but he is a dangerous weapon out of the backfield. Jeremy Hill is a different cat entirely. At 236 pounds, he is all about that bass (no treble) and he’s a bad boy. Dude just runs downhill, and has a lot more breakaway speed than his frame would suggest. As is the case at all levels of football, the better you can run between the tackles, the more open intermediate throws are going to be off play-action. I am relatively confident that Bengals’ wide out AJ Green wont beat the Phins deep in this game because the Dolphins typically do a good job of preventing the long ball, but if the Bengals are running well, then playfakes against zone defenses early in the down and distance will breakdown Miami. After three games, Jelani Jenkins and Kiko Alonso are already getting neck cramps from watching so many passes sail over their heads to wide open targets over the middle after they bite hard on play-action, and this game has the potential to be no different. Again, Eifert being out helps a lot, but at the end of the day, if guys are running wide open down the seam, it could be a long night for this Dolphins defense. Jenkins and Misi are hurt and not playing, and that can’t bode well for the defense given how unproven Neville Hewitt is, even though he looked great in a couple of games at the tail end of last year (Dallas, New England). I just don’t see it, sorry guys. The fact of the matter is this: The Miami Dolphins are not a good football team, and the Cincinnati Bengals are. 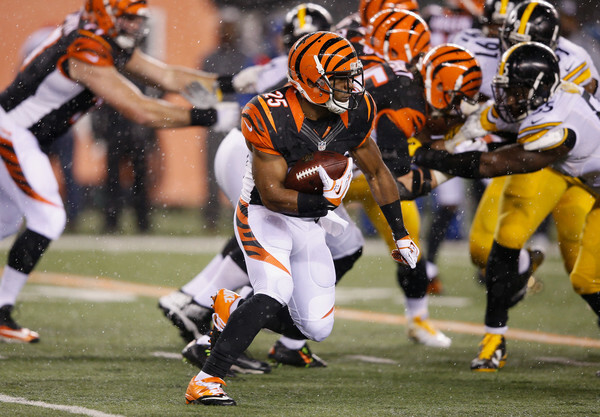 The Bengals are also home and it’s hard to bet against the better team with the better roster on a short week at home. I think that this will be a close game until about the 6:00 minute mark of the fourth quarter when Cinci will put together a drive to go up two scores and ice the game away.